Masivo Hybrid Hot Pepper is very tasty with a mild heat. It produces high yields of extra-large, glossy, dark green fruits that grow to about 7 ½ inches long. 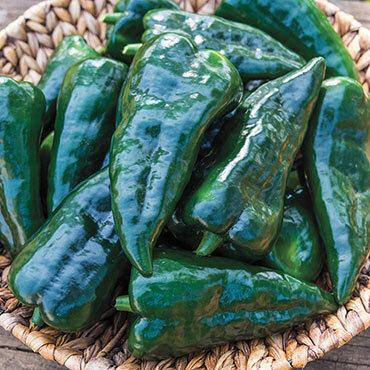 Use the peppers green as poblano peppers or let them dry for use as ancho chili seasoning. Plants are vigorous, upright growers with good disease resistance. 70 days to maturity. Depth: Plant seeds 1/4 inch deep. Start seeds indoors 6 - 8 weeks before the last frost date. The plants should be planted the same depth as in the pots. Germination: 10 - 15 days at soil temps over 70 degrees F.
Fruit: Extra-large poblano/ancho peppers with attractive, dark green, glossy fruit. The 7 1/2 inch peppers are very tasty with a mild heat. Soil Preference: Well-drained, light, moderately fertile soil, high in organic matter.